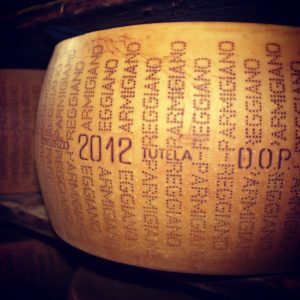 What are the characteristics of Parmigiano Reggiano cheese? Firstly, a wheel of Parmigiano Reggiano cheese has to weigh between 24kg and 40kg (averaging at 38.5kg). Production requires 500 litres of milk, or 16 litres for every kilo of cheese. The forms should be moulded in the characteristically cylindrical shape of a pale yellow colour. The texture should be granular and friable, with the distinguishable presence of white granules of amino acids measuring 2mm to 4mm in diameter. The minimum aging period is traditionally 12 months, but there are three standard aging periods: more than 18 months, more than 22 months and more than 30 months. 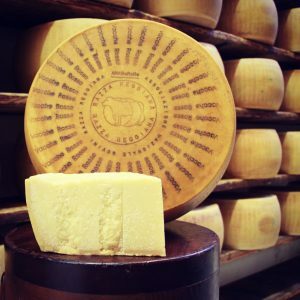 The cheese production should strictly take place in the geographic region between Parma, Reggio Emilia, Modena, Bologna (West of Reno) and Mantova (to the South of the river Po). Lastly, it should have the distinctive pitting on the surface of the crust, which identifies all the various forms and identifies the quality of every single form, which features the registration number of the dairy, the month and year of production, the words DOP and ‘Consorzio Tutela’. A piece of casein is applied on the surface with features the year of production, the C.F.P.R label and an alphanumeric code that identifies each individual form. All of these components are essential to produce the Parmigiano Reggiano hallmark. Some dairies still use the Reggiana breed to produce a top quality cheese. The Vacche Rosse were introduced to the area around the Po Valley by the Longobardi. The Reggiana breed is a red coloured race of cows that came to Italy from Eastern Europe during the period of the Barbarian invasions, and probably hailed from the populations of Southern Russia. It is a strong race ideal to produce milk but also to work in the fields and in meat production, which became common throughout Northern Italy until the middle of the last century. When machines eventually replaced them in the fields, the red cows were reclassified as cows suitable for the production of milk and they even superseded the Friesian in quality. Unlike the Frisian, the red cow – named so thanks to the characteristic colour of its coat that is similar to a kernel of wheat – produces a milk especially rich in protein, casein and calcium that makes it particularly suitable for the processing and production of Parmigiano Reggiano. To protect their superior quality, the National Breeders Association of the Reggiana Bovine Breed was founded in the 1980s to monitor and guarantee the quality of the red race and especially of its products. Thus, the Parmigiano Reggiano Vacche Rosse is made from Reggiana breed milk and aged for a minimum of 24 months (as opposed to the regular 12 months), giving it superior quality and nutritional properties. In turn, the production of Vacche Rosse Parmigiano Reggiano is regulated by the Regulations of the Consortium for Parmigiano Reggiano Cheese Protection, under the auspices of the European Union. A further specific production regulation is in place by the National Association of the Reggiana Cattle Breed (and is adhered to in producing the Parmigiano Reggiano Vacche Rosse). The production of Parmigiano Reggiano Vacche Rosse started in the 1990s and today provides a cheese of superior biological quality. 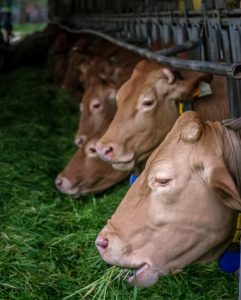 In fact, the cows from the Reggiana breed only eat hay and feed that is strictly certified non GMO and without techniques that force milk production. This is why the red cows can live up to 10 years of age. 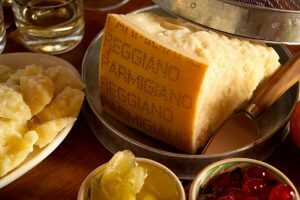 For all of these reasons, the Parmiggiano Reggiano Vacche Rosse is a personalised brand. 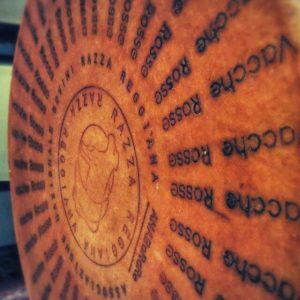 Besides reporting all the information on the wheel of Parmesan cheese, the cheese produced by Vacche Rosse has a distinctive brand mark stamped on the form plate. However, to obtain this mark, the form must be perfect, free from defects and aged for at least two years. Above all, it will be of a higher quality. In our online shop you can buy our Red Cows Parmigiano-Reggiano and other products of the Consortium, among these Butter, Ricotta, Stracchino and Yogurt. All products made with Red Cows’ milk.